Bought for 2nd baby and was amazing!! Best baby buy we bought, defo using with 3rd makes journeys so much easier. All of the family was so amazed at how easy but still how safe it looked!! So I have a fiat 500 L and the isofix base doesn't sit well in it and it makes a rattling noice and the leg that makes it sturdier by pressing on the floor doesn't feel 100% secure. Before anyone thinks I'm a bad parent I took it to mothercare and asked if I'd done everything right and they said it looked fine... I still use it now but don't have the money to go out and buy another one to see if it's any better. So anyone buying this with a fiat 500 L I'd advise against it. This isofix is fantastic, this is one of my favourite things for the baby! You do not have to worry about whether you have strapped the car seat in correctly and when the weather is bad your not stood fiddling trying to get the seatbelt on simply place the car seat on top of it and your done. Easy to use, safe and secure. This isofix base is a godsend. A click on carry seat base that is very easy to use and a great time saver whislt being safe and secure. This is a great product to save both time and your back. A little pricey, but a great investment, especially if you plan on having more than one child. I highly recommend. My baby is 5 weeks old and this isofix bass has been one of my favourite products yet - it makes getting out of the house that little bit easier as the car seat just clicks straight in and you know you baby is safe. I like how the red turns to green to show that you have got the isofix fitted correctly and the car seat in place, this gives you peace of mind! Not a bad word to say about it. I would recommend this product as it saves a lot of time when you have a little one. It is quite expensive but I would say its worth it. Only thing I would change is that you have to bend over the car seat to see the green marker on the opposite side to you to check it is in properly. I bought this to.go along with the Simplicity car seat. I'd done quite a bit of research into making sure my daughter was safe in the car and although the Simplicity car seat can be used without an isofix base, I felt safer for it to be clicked in than just using.a seat belt. I love how the indicators turn green when the seat is attached correctly too. I also love the fact that it is so easy to click in so when you are running around, you can safely click the seat to the base in seconds rather than having to mess around with the seat belt. Really love this base for the silvercross simplicity - I love the ease of it all. It is on the pricy side but worth it to have our whole car system working for us. Being on the shorter side I struggled to fasten the seat belt around the car seat. But after purchasing the base it has been so much easier and less time for our baby to be exposed to the cold air. As it’s a simple click and go. It is very straight forward to use with its green tabs and has saved me so much time. Would definitely recommend to anyone that has the silver cross car seat. Super easy to use, once installed so easy to attach the baby car seat, just click on! Really love how easy it is to attach the silvercross car seat to the isofix base, just click on, and seat is securely attached, and the red tabs go green to reassure you that it’s safely attached. So glad I purchased! This isofix base is almost perfect! The only issue with have with this is that it's a bit of a pain to clip in but once it's in it's amazing! The colour indicators helped loads for when I first used it as I haven't used isofix for my first child! Overall i am very pleased with this product. It is very easy to use and install. I feel it is safe and secure with easy indication when fitted correctly. Only issues I have is when in certain cars with angled seats, this angles the isofix which make car seat sit more forward. Also only fits infant car seat which at over £100, makes it not great value for money. That being said, I feel using the isofix with this car seat brings peace of mind and will continue to use this until it is outgrown. I purchased an isofix base to go with my silver cross car seat. It is very simple to use and gives me peace of mind that the car seat is safe and secure as the seat locks into place and feels study when attempting to move. However I do think it is quite expensive when I have already payed a lot for a travel system but I feel the strengths outweigh the weaknesses and wouldn’t want to risk my baby’s safety by not having one. Takes the stress out of fitting a car seat with the seat belt. This product is amazing it really takes the worry out of fitting a car seat. In most cars it is so easy to fit only in older cars it can get a bit tricky. Just so ray for on the go and really sturdy. I highly recommend. Perfectly named this product is exactly what it says on the tin. Simple, easy to use, for for purpose product. There are no bells and whistles on this isofix but it does what it needs to do and is very well made. Fits in the car with ease with the easy to read safety indicators to show the isofix has been installed correctly. Car seat clips on without a fuss and the base is easy to remove if you need to swap vehicles. Would recommend this product and even looking to buy a second one for the husbands car. Fantastic product. I have a fiat 500 so having the silvercross isofix base in my car makes my life so much easier! Just clip in and go! Super safe! Absolutely ideal! This isofix made putting the car seat in the car so much easier. It is easy to fit in the car which is handy when changing it to a different vehicle. However, it's expensive for what it is (thankfully we got a 2nd hand one) and it only fits the 1 car seat on it which means once the child changes car seat it cannot be used. It's also fairly heavy. I’m awful with fitting car seats so this was an absolute god send. It is easy to fit in to the car and then to clip the seat in and out of. I love this product! It makes travelling with a new born so easy! The red to green slots gives the user peace of mind that the child is safely Attached! Saves so much time fiddling with car seat belts! This product is easy to use and makes you feel like the car seat is safe and secure. Heavy to install. Although not an issue once in. Great product. A little pricey but gives you peace of mind that the car seat is in and as safe as possible. I love that the seat is so obvious when fitted correctly or not - with the green and red colours on it. This is so easy to use, and so handy. Makes getting baby in and out of the car so much easier! Bit stiff on the initial insertion. to the car, but you leave it in, so it's not really a problem. Very easy to fit in a car with isofix points. The bright yellow fitting parts help to guide the fitting. The safety features of the red indicators that change to green when the seat is attached correctly ensure correct fitting every time. The car seat attaches with ease and has a quick release button to ensure you are not struggling to remove the seat from the base. 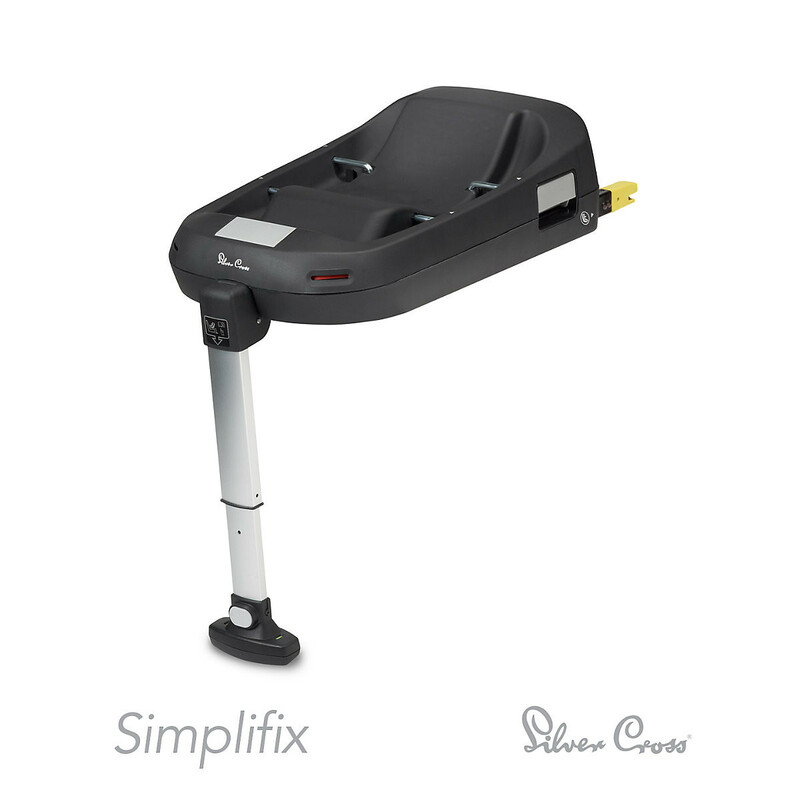 The Silver Cross Simplifix Isofix base allows you to correctly fit your Silver Cross Simplicity car seat in your vehicle safely and quickly every time you travel. 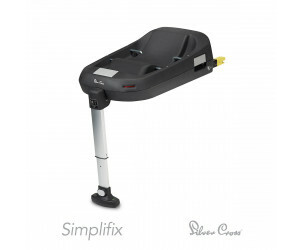 The Silver Cross Simplicity car seat is easily connected to the base with one simple click and also easily removed. The Isofix connectors of the Simplifix base easily attach to the Isofix points in your vehicle. The adjustable leg on the base provide additional stability and ensures correct contact with the vehicle's floor. and the three colour indicators confirm that the seat is safely and correctly installed every time. Don't Forget...The Silver Cross Simplicity car seat combines with Silver Cross prams and pushchairs to create a travel system.